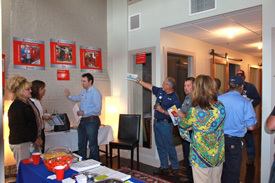 McCotter Energy Systems hosted our second annual High Efficiency afternoon and Summer Barbecue on Thursday, August 15. The event was a great success! This year we added water heating equipment and John Brody was on hand to explain the benefits of the new Aerco Innovation tankless, instantaneous water heaters. Thank you to Jason Smith, Riello Burners, Dave Lehrer, Siemens Combustion Controls, Jeff Hurst, Hurst Boilers and Ron Guth, Bryan Boilers for attending the event. Focus on Energy also participated and explained additional incentives available. 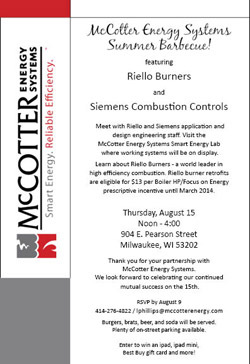 The event took place in the McCotter Energy Lab located near downtown Milwaukee. The Smart Energy Lab is available for customized training sessions. 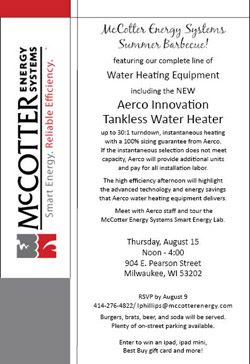 To schedule, please call the McCotter office at 414-276-4822. Thanks to all who attended! McCotter Energy Systems is hiring! The Technical Service, Parts and Warranty Manager will play a key role in the operations of McCotter Energy Systems. The person in this position will be the main technical contact for our contractors and service technicians. The role requires technical expertise, excellent customer service and organizational skills. Technical Service – Provide technical support for contractors and service technicians in regards to installation, application, service issues and performance issues by phone. Service – Arrange all start-ups of new equipment and schedule all service calls. Gather all service reports and prepare for invoicing. Associate’s Degree in a related field or equivalent combined education and experience. A minimum of 2 years field experience working in the boiler industry servicing HVAC equipment and controls. Experience working with contractors and vendors. Proficiency in a Windows operating environment, including email and Microsoft Office software. 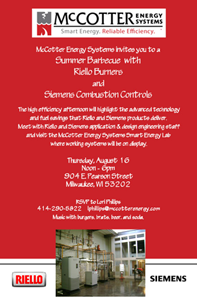 McCotter Energy Systems hosted a High Efficiency afternoon and Summer Barbecue on Thursday, August 16. The event was a great success! We extend special thanks to Jason Smith and Kevin Bond, Riello Burners, and Bert Leng and Dave Lehrer with Siemens Combustion Controls for participating and discussing the capabilities of the high efficiency equipment. 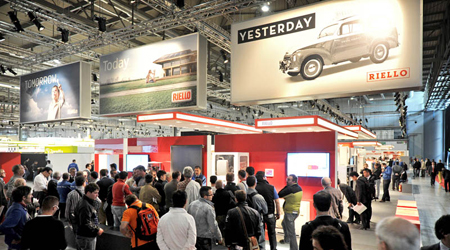 The Mostra Convegno Expocomfort 2012 was held in Milan, Italy and drew over 155,000 attendees from all over the world. The convention is similar to the United States ASHRAE covention. Dan McCotter says, "The MCE show is an excellent opportunity to see emerging technologies in the high efficiency HVAC equipment category." Dan and Tom McCotter both attended the show and had the chance to also visit the Riello Burner facility. McCotter Energy Systems is proud to be the HVAC partner for the following projects: Museum of Wisconsin Art, Green Bay VA, Racine Journal Times, Madison Fire House #5, Fitesa, Republic Michigamme, Reindl Printing, First Congregational Church and Neenah High School. 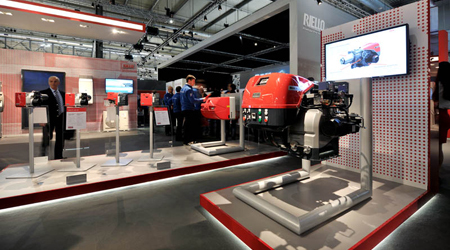 Aerco, Hurst, Bryan and Riello products were installed to achieve high efficiency and long lasting operating life of the equipment. McCotter Energy Systems is featured in the Spring edition of Wisconsin Plumbing Heating Cooling Contractors Association magazine. The magazine is a great source for WI contractors. We discuss HVAC trends for 2012 including high efficiency burners, semi-instaneous water heaters and the digital boiler room. Click to view the article. With the warm weather we have been lucky enough to enjoy this year the calls for Ultra Scale Away non-hazardous descaler have increased dramatically. 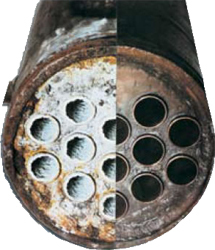 UltraScale-away is a liquid solvent designed to dissolve and eliminate water scale, lime and rust. Fast acting Ultrascale-Away thoroughly cleans equipment in a matter of hours. The easy-to-use, non-hazardous, biodegradable premixed solution can be handled by regular personnel, no specialized cleaning crew is necessary. UltraScale-away dissolves approximately 2 pounds of lime per gallon. Call or email for pricing. Happy Spring Cleaning! Follow the link for more information on UltraScale-away. McCotter Energy Systems is now on facebook and linkedin! Both sites are a great place to highlight current projects and share product news. We invite you to connect with us to read about the latest updates! The ASHRAE show is the opportunity to see new products and meet with all of our principals. We look forward to attending each year. This year the show was held at McCormick Place in Chicago. 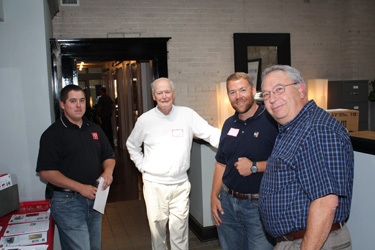 We started the week at the Hurst Boiler brunch and were recognized as one of the top 10 sales contributors for 2011. Monday and Tuesday were spent walking the show and Tuesday night we were awarded the Platinum Sales Award from Riello Burners. The show was informative and we returned safely and eager to begin another successful sales year. McCotter Energy Systems is proud to announce that Charlie Gary, Lori Phillips and Adam Wedekind have all earned a Facility Operating Engineer license from the American Society of Power Engineers (ASOPE). All three attended Power Engineering classes at Milwaukee Area Technical College and successfully completed the classes and the licensing exam. 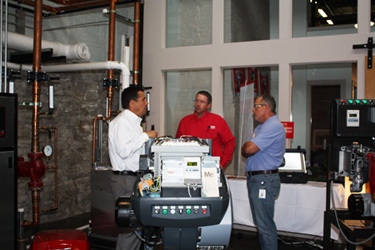 McCotter Energy Systems provides Smart Energy and Reliable Efficiency with our Red Boiler Package. Hurst, Bryan or Smith boilers packaged with Riello burners provide our customers substantial energy savings and a long term value. The St. Elizabeth Hospital project is featured in Engineered Systems July issue. The hospital earned the ENERGY STAR designation from the Environmental Protection Agency. We are a proud partner and supplied the High Efficiency Red Boiler Package with Hurst Boilers, Riello Burner and integrated touch screen controls. 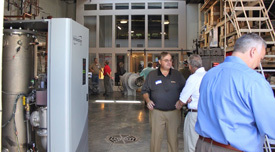 McCotter Energy Systems is proud to be a part of the Discovery World Museum by providing RBI Futera III boilers. The project is featured on the RBI website. 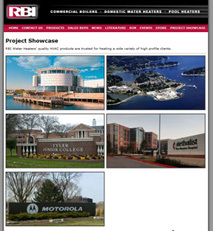 McCotter Energy Systems showcased on the RBI website.